Salina: How did you come to be such an amazing pianist? Larry Willis: There was a piano in the house, and I had an older brother who was classically trained. I started out as a singer. I was a voice major at the High School of Music and Art and a voice major initially at the Manhattan School of Music. At the end of my junior year, one of my buddies who lived down the block brought over a jazz album. We had just bought a new, back in those days, it was High Five before stereo, and we put this record on and it changed my life forever. The record was called Miles Davis “Kind of Blue.” Since the piano was there, I started to piddle around, listening to Miles’ piano players like Bill Evans and Red Garland and Wynton Kelly. I got interested and started to play — taught myself until I got to the Manhattan School of Music. I met a guy there and we became friends instantaneously and we ended up playing a lot together for over a 58-year period. His name is Hugh Masekela. As a matter of fact, I’m going to South Africa next Thursday to produce an album in memoriam to him. There was another guy who I met in a practice room and we became great friends. I teased him quite a bit because he wore glasses, too. His name is Herbert Jeffrey Hancock. I started to play around, and you know, New York is a very small community as far as musicians are concerned. I got to meet Jackie McLean, and when I was about 19 or so, he came up to my mother’s house and asked my mother’s permission to take me on the road. I’ve been doing it ever since then. Salina: That’s such a nice story! 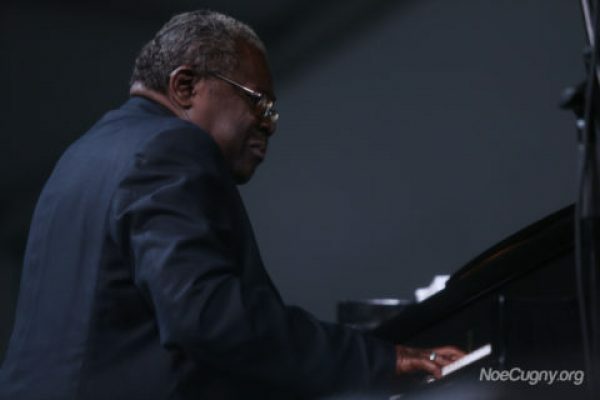 Larry Willis: As a matter of fact, you might be able, at some point in the not-too-distant-future, to read my whole story because I’m in the process of writing my book. I have a very dear friend that I sort of grew up with. I’m a little older than he is, but he’s a great writer. You know him as one of the greatest basketball players ever. His name is Kareem Abdul Jabbar. He’s helping me to write my story. Kareem was an English major and has written over 14, 15 books under his name. He also writes for Time magazine. He’s quite astute in that way. He’s one of the greatest people I know. Aside from his talents athletically, he’s an avid humanitarian. One of the things that I’m trying to do now is to get people I know who have the means to contribute to his Skyhook Foundation, which is here to help inner city kids and to push the arts forward. Larry Willis: I love you. Salina: And what do you think about the club? Larry Willis: The club is fantastic. Absolutely fantastic.